Let these quotes by Henry Ward Beecher help you to have a positive attitude toward life, and to think positively. but what we give up, that makes us rich. and in order not to do wrong, never do anything. than the editorial columns are. put in the right spot. but a school for the education of imperfect ones. else that so beautifully furnishes a house. and never persist in trying to set people right. any more than a boat without steam or a balloon without gas. You cannot sift out the poor from the community. The poor are indispensable to the rich. shadows which our sorrows cast. and no one is without himself. he cannot be a Christian anywhere. A book is good company. It is full of conversation without loquacity. I pray on the principle that wine knocks the cork out of a bottle. There is an inward fermentation, and there must be a vent. We steal if we touch tomorrow. Suffering is part of the divine idea. is much better at the top. The dog was created specially for children. He is a god of frolic. down is weaving when it comes up in the morning. It's not the revolution that destroys machinery it's the friction. It is the heart that makes a man rich. He is rich according to what he is, not according to what he has. What we call wisdom is the result of all the wisdom of past ages. upon the roots of the old trunks that have crumbled away. for he never thinks he gets as much as he deserves. 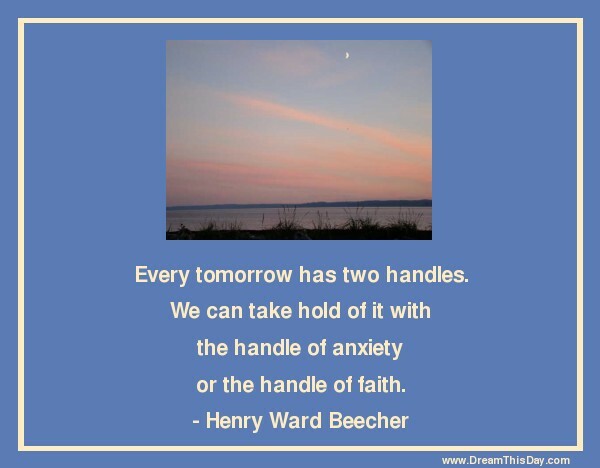 Thank you for visiting: Henry Ward Beecher Quotes - Positive Quotes by Henry Ward Beecher.